I can hardly believe it's December this weekend! Where has the time gone? I know this next month is going to go by in a flash. I'm busy at the moment with organising the last weeks of the year and making sure everything is sorted. I've also begun thinking ahead to the New Year, I just don't seem to be able to help it. I'm also looking forward to having 2 weeks off over Christmas & New Year. This year has been very big for my business and I can hardly wait to have some time to collect my thoughts, read some books and, of course, do some knitting! With all of these things on my mind, I'm still trying to remain present 'in the moment' and not get too caught up with the speed of time. As I was checking over the second issue of Yarnologie this week (it's due to be published on Saturday), I started to think about Christmas gift knitting. Making for others isn't something I've done a lot of this year, but when I do gift knit it's something I always enjoy. I've written before about handmade gifts here if you're unsure about giving something you've made yourself this year. (There's also a piece in Yarnologie about it). If you are sure though, and just haven't quite decided what to make, here are five project ideas for gifts to knit this Christmas (or any time, really!). There's also a discount code at the bottom of this post to use with the featured patterns over the next week. The Tea Mouse is a project you can complete in a weekend. Suitable for any skill level, Tea Mice make lovely gifts for both children & adults. They sit on a shelf in an office or bedroom with their nose pointed in the air, making you smile every time you see them. You can also add a sachet of lavender to the Tea Mouse when stuffing for an extra special touch. 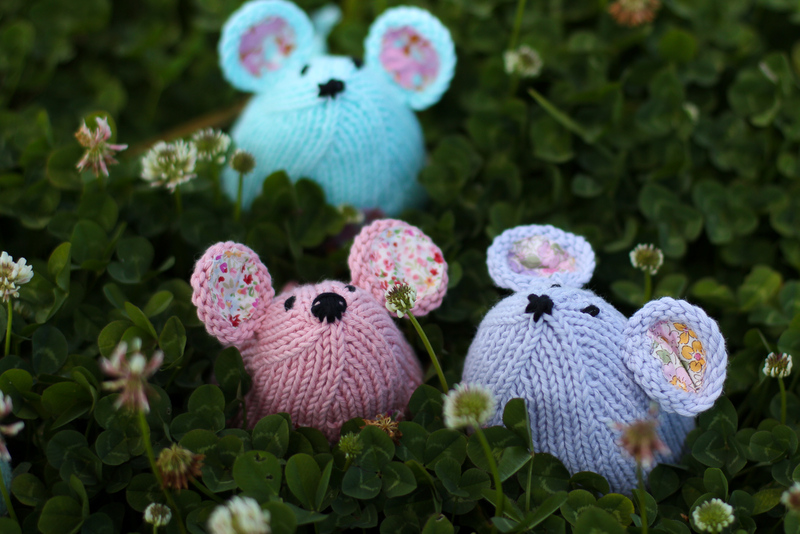 Tea Mouse knitting pattern is available here and kits are available here, too. Bonus gift idea: The kits themselves make a lovely gift for your favourite knitter. Sweet Little Picnic Owl is a shy and modest creature who will blush when you praise her. She sits unassumingly on a shelf, waiting for you to notice her which you are sure to do as she is very cute. Knit her in different weights to create different sizes, and make a family of owls. Little Picnic Owl knitting pattern is available here. Do you have a little girl to make for? 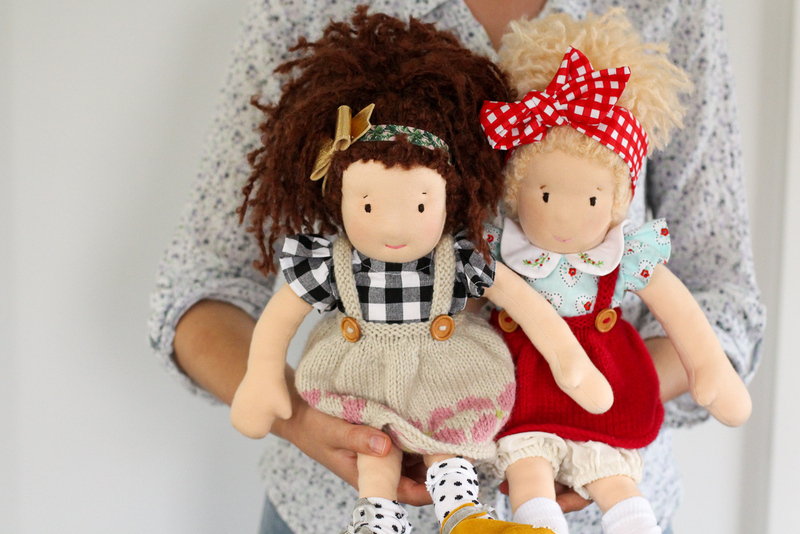 Knit a sweet pinafore for her favourite doll, or perhaps as an added accessory to one Santa might be bringing her. Suitable for all skill levels, you can knit the pinafore plain or with a border of flowers. The Posie Pinafore knitting pattern is available here. 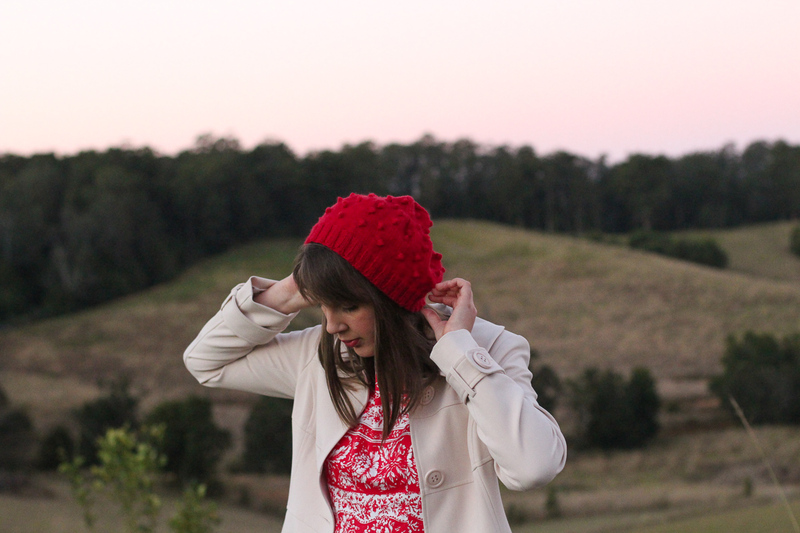 For the stylish woman on your gift list, look no further than the Cherry Pie Beret. Fun and quick to knit, it's a pretty gift that is sure to delight. The Cherry Pie Beret knitting pattern is available here. 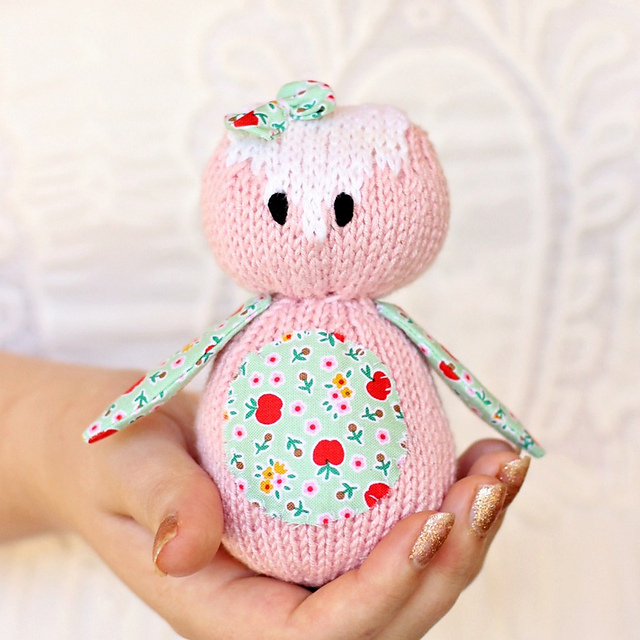 This gorgeous rattle is fun and easy to knit, suitable for any skill level. It makes a delightful gift for any baby, or leave the rattle insert out and knit it as a toy. 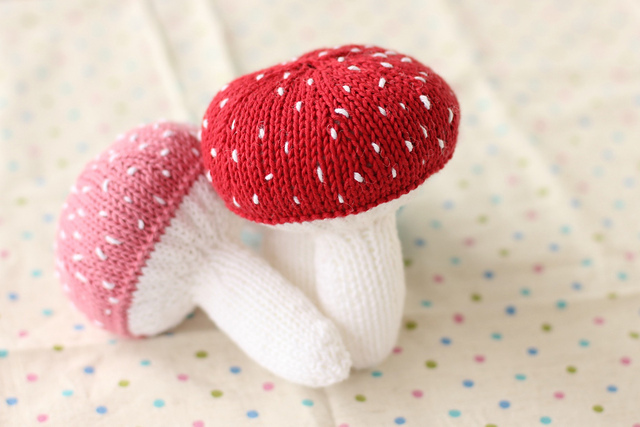 The Mushroom Baby Rattle knitting pattern is available here and kits are available here. Use the code GIFTKNIT at checkout to receive 10% featured patterns for the next week. Happy knitting!